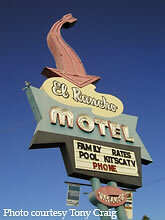 This unique sign for the El Rancho Motel in Mesa still advertises the motel's family rates and pool. 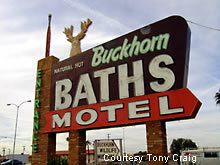 Here's a nice neon sign for the Buckhorn Baths Motel, one of the roadside motels found off the main drag in Mesa. The young buck character can be seen peeking up over the top of the marquee. The motel is one of the city's iconic landmarks. 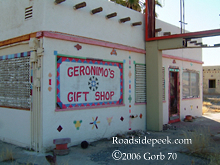 The place was built in 1936 as a gas station and trading post, serving travelers coming up the main drag of town. Owners Ted and Alice Sliger added a bath and rooms when a hot springs was discovered in 1939. Eventually, the Buckhorn Baths was transformed into quite a tourist trap with a wildlife museum featuring 400+ taxidermied animals. In fact, professional baseball teams used to stay here, enjoying the pampering and healing of the hot spring waters. (Left) A little gift shop located on the site. 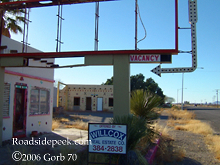 The Horseshoe Motel in Arizona tries to lure in roadside tourists with its flashy colors and interesting marquee. Here's another marquee found in Mesa. 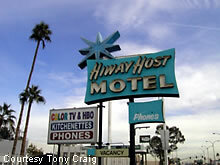 The Hiway Host Motel features a name that's somewhat commonly found as you travel the roadside. This sign will do the Hiway Host name proud with its colors and prominent starburst on the top of the sign. The palm trees on site also add to the look. The Hiway Host appears to date back to the 1950's or 60's.